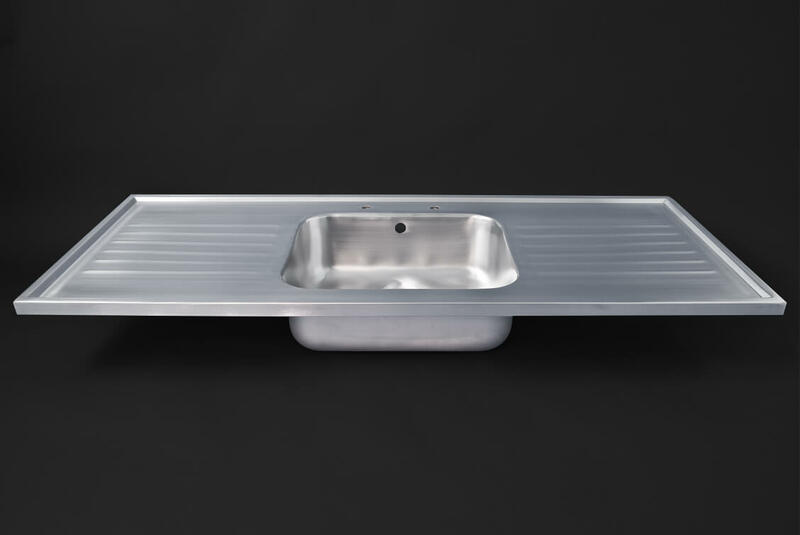 Our stainless steel sit-on sinks are designed to double as a work surface in their own right, but with the adition of a water retaining edge profile to all sides. 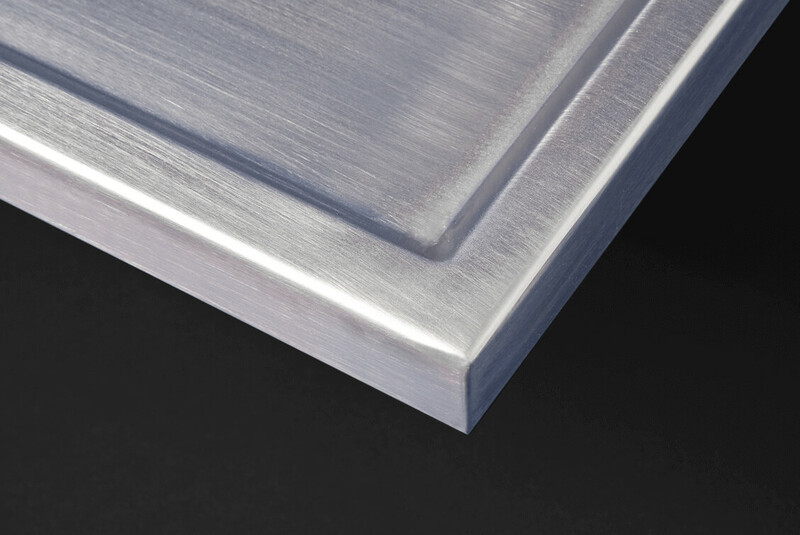 They can be fixed with ease on to a new or existing base unit or framework, dispensing with the need to fit a separate stainless steel worktops. In a choice of 304 (food-grade) and 316 (laboratory-grade) metal, these sink units are supremely hygienic, making them the ideal choice for a catering, laboratory, veterinary or healthcare environment. With their satin polished, stain-resistant surface, they are also an aesthetically pleasing choice for any setting, from a school food technology classroom to a home kitchen. Our stainless steel sit-on sinks can be supplied to any length and width, and with any number of prefabricated bowls – please consult the size chart below for the bowls available. Alternatively, where a specific size, shape or configuration of bowl is required, order a fully-bespoke unit, whereby the bowl will also be made to your precise measurements. In these premium units, you can specify every detail, including the siting of waste and overflow holes (if required). All of DSM’s sit-on sinks are supplied with a moisture-resistant MDF base layer, which lends superior rigidity to the unit and facilitates easy fitting. All feature integral water-retaining edging, or upstands where preferred. If you require an entirely freestanding unit, we can supply the sink with a bespoke stainless-steel frame. DSM prides itself on supplying high-quality, durable products to the laboratory arena. Our sit-on sinks will fix neatly on to an existing or new base unit or framework – and, with their integral drainer, will provide a useful extra work surface. The 316-grade steel is resistant to impact, extremes of heat and harsh chemicals. Where epoxy resin has been known to crack under contact with liquid nitrogen, our steel sinks will remain unblemished. In labs where a larger working area is required, consider a double-drainer unit. These bespoke pieces are just one of the almost-limitless configurations available in our range of made-to-order sit-on sinks. These premium units can feature any number of bespoke bowls and drainers, plus any siting of holes for waste and tap placement. All of our sit-on sinks can be supplied with a choice of either the standard water-retaining edging, or an upstand to any (or all) sides. For a clean-room environment, we can omit the MDF subframe, to ensure you reap the highest benefit from the steel’s antibacterial, corrosion-free surface. DSM’s wide range of laboratory products all features the same high quality and durability. From worktops and inset sinks to hand-wash basins, fume cupboard liners and shelving, we can fabricate and supply the exact items you need for your lab environment. Contact us today, to find out how we can supply custom units to fit your requirements and specifications. 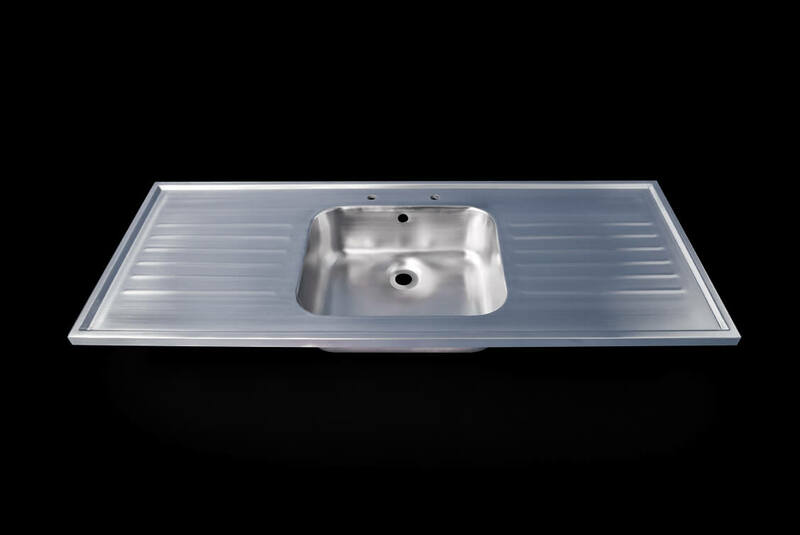 For a flexible working environment, choose a stainless-steel sit-on sink from DSM. Designed to double as an extra work surface, these sinks feature a subframe made from moisture-resistant MDF, which both lends additional strength to the unit and facilitates fixing to an existing or new base unit. Made from antibacterial steel, these sinks are simple to clean, making it easy to maintain the high hygiene standards required of your clinic, hospital, care home or dental practice. They can be configured to any design, from a single bowl and drainer to multiple bowls and/or a double drainer. For a laboratory situation, choose our 316-grade steel, which will stand up to even the harshest of chemicals. All of our sit-on sinks are made to order. Choose from one, or several, of our prefabricated bowls – please consult the size chart for options. Alternatively, order a unit featuring bespoke bowls, each of which will be custom-made to the size and shape you require. 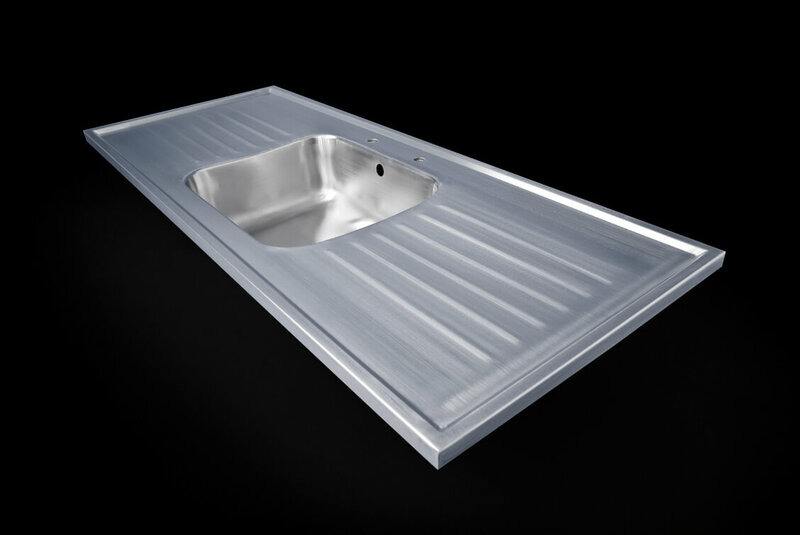 We can even supply your drop-in sink with a stainless-steel support frame, to provide a separate, freestanding unit. With all of our drop-in sinks, you can choose either water-retaining edging or an upstand to any or all sides. Contact us today, to find out how DSM can fabricate and supply many more robust, highly-finished products for your clinic, dental practice, hospital or care home. With our wide range of stainless-steel items – including worktops, shelving, cupboards and hand-wash basins – we have the knowledge and expertise to supply high-quality, durable items for your project. Designed for easy fitting on to a new or existing base unit, our sit-on sinks are made from high-quality stainless steel, which is so robust and impact-resistant, it will far outlast other materials. The naturally antibacterial properties of the metal make it ideal for kitchens, food science classrooms and laboratories. With its smooth, gleaming surface, it is also easy to clean and maintain. These sit-on sinks function as both a sink and an additional work space – dispensing with the need to fit a worktop as well. They feature an underlay made from moisture-resistant MDF, which both facilitates fitting and supplies an astonishing level of rigidity and strength to the unit as a whole. Because each of our drop-in sinks is made to order, we can integrate any number of bowls in to the unit, and you can specify either a single or double drainer – the latter being ideal, where extra work surface is needed. The prefabricated bowls are available in a range of sizes, and in a choice of 304- and 316-grade steel: please consult the size chart for details. In addition, we can fabricate any number of bespoke bowls, to fit a precise situation or application, including overflow-free bowls, for clean-room applications. DSM has been supplying stainless-steel products to the educational sector for decades. Take a look at our full range, which features wash troughs, hand-wash basins, cupboards, extractor canopies, worktops, shower trays and fume cupboard liners, among many others. Contact us today, to find out how we can fabricate and supply the products you need for your school, college, university or preschool. Made from naturally-antibacterial stainless steel, our sit-on catering sinks are ultra-hygienic, impact-resistant and supremely durable. Designed to ‘drop in’ to an existing or new unit, they function as both a hard-wearing sink and an additional work surface. Where even more work space is required, consider a unit with a double drainer. We can also fit any number and configuration of bowls; please take a look at the measurements chart for full options. In cases where our range of prefabricated bowls will not fit the situation or application, we offer a bespoke service, by which we can fabricate each bowl to your requirements. In this instance, you can also specify the precise siting of waste and overflow holes. All of our sit-on sinks are offered with the choice of a raised, water-retaining edge, or an upstand to any or all edges. DSM has been supplying high-quality steel products to the catering sector for decades. We can fabricate and supply worktops, cupboards, shelving, drawers, splashbacks and hand-wash basins, among others. Contact us today, to discuss your needs. Installing a sit-on sink in your washroom is the ideal way to avoid having to fit a separate worktop. Stainless-steel sit-on sinks from DSM can feature a single or double drainer, and can function as a bowl, drainer and vanity surface all in one neat unit. A moisture-resistant MDF subframe lends additional strength and rigidity, and makes fitting straightforward: simply screw to a base unit. Where a freestanding sink unit is required, we can fabricate a frame to fit the sink. These sinks are tough and impact resistant, making them perfect for use in both public and private washrooms. What’s more, the steel features antibacterial properties, which facilitate the maintenance of high hygiene levels. Choose any quantity and siting of bowl/s, and a single or double drainer. The standard bowls are available in a range of sizes – please see our chart for full details. There is also the choice of a raised edge or a full upstand on your sink unit. Where a specific size or shape of bowl/s is required, we also offer a range of bespoke bowls. With these premium pieces, you can specify the precise location of waste and overflow holes. Our washroom range features a variety of other hard-wearing, gleaming, stainless-steel pieces, including: vanity tops, splashbacks, hand-wash basins, wash troughs and shower trays. Get in touch today, to discuss the requirements for your washroom. Our sit-on (or ‘drop-in’) sinks are made from lustrous, contemporary stainless steel, which will not only add style to your kitchen, but will also last for decades. Easy to clean and ultra-hygienic (thanks to inbuilt antibacterial properties), these products are designed to eliminate the need to fit a worktop as well as a sink – the sink unit simply fixes directly to the base unit. Fitting is easy, thanks to a moisture-resistant MDF subframe, which also lends strength and rigidity to the unit as a whole. Apart from their aesthetic value, another major attraction of these sit-on sinks is their adaptability: choose any combination of integral bowls for washing utensils, hands or vegetables, and choose from either a single or a double drainer, depending on the available space and your needs. If you prefer a freestanding unit, we can supply a stainless-steel frame to support your sink. DSM can also fabricate an entire kitchen made from high-quality stainless steel. For bathrooms, our steel hand-wash basins and shower trays make a stylish statement. Get in touch today, to discuss your interior-design ideas. Hygienic, easy to fit, and versatile: our stainless-steel sit-on sinks are a must-have item in your veterinary practice. Made from antibacterial stainless steel, and designed to fit to the top of an existing or new base unit, these sinks dispense with the need for a separate worktop, by offering work space in the form of either a single or double drainer. A moisture-resistant subframe made from MDF adds a reinforcing layer of strength and rigidity, and makes fitting straightforward. where the standard-size bowls do not meet the needs of your practice, order a bespoke configuration of bowls in the precise size/s and shape/s you require. The options don’t stop at sit-on sinks: at DSM, we pride ourselves on supplying the exact item a client requires – be it a set of stainless-steel stairs to give larger pets access to the examination table – or a specific size or shape of sink, cupboard, trolley or worktop. Contact us today, to discuss your requirements.